Here we go again. An atheist organization files a lawsuit. They are offended. This time the target: a Cross placed at the World Trace Center Memorial and Museum at Ground Zero. It is unbelievable that these lawsuits keep coming. As you may recall, lawsuits by atheist organizations have failed repeatedly - in challenging the National Motto, Pledge of Allegiance, as well as the National Day of Prayer. This suit, too, is likely to fail in court. But like all litigation, it must be taken seriously at this point. That's why I have instructed a legal team to begin preparing a critical amicus brief to be filed in support of the Cross memorial. We will represent former NYC firefighter and first responder Tim Brown, who lost more than 100 friends that fateful day. Our friend-of-the-court brief will clearly show that this suit is deeply flawed and without merit. It will also show that this memorial is not only a critical part of 9-11 history, but a constitutionally-sound reminder of the horrors that occurred at Ground Zero nearly a decade ago. American Atheists, the group which filed the suit, released this statement about the legal challenge: "The WTC cross has become a Christian icon. It has been blessed by so-called holy men and presented as a reminder that their god, who couldn't be bothered to stop the Muslim terrorists or prevent 3,000 people from being killed in his name, cared only enough to bestow upon us some rubble that resembles a cross. It's a truly ridiculous assertion." This mindset and lawsuit represent another pathetic attempt to re-write the Constitution and re-write history by removing a symbol that has deep meaning and serves as a powerful remembrance to that fateful attack on September 11, 2001. And, of course, in the lawsuit, the atheist group claims injury - specifically claiming that their plaintiffs "continue to suffer damages, both physical and emotional, from the existence of the challenged cross." They are injured by the mere existence of the cross? We're talking about two intersecting steel beams that held up when the Twin Towers collapsed. Yes, it is cross-shaped. But, suffering physical and emotional damage because of the existence of the cross? Give me a break. This claim is ridiculous. If someone doesn't like it, look the other way. Skip that part of the exhibit. The courts routinely reject this kind of reasoning. Consider the decision in April by a federal appeals court which rejected a challenge by another atheist group and upheld the constitutionality of the presidential proclamation for the National Day of Prayer. In that decision, the court correctly concluded: "Hurt feelings differ from legal injury." And last fall, a federal appeals court rejected another legal challenge by an atheist group attempting to remove the Pledge of Allegiance and the National Motto inscribed at the Capitol Visitors Center in Washington. In our amicus brief in the case, we argued that the lawsuit "borders on frivolous" and serves no purpose other "than to waste judicial resources." The appeals court dismissed the suit. Now, at Ground Zero, at a memorial to mark this tragic and historic chapter in U.S. history, another legal challenge. And, what's clear to me is that this suit represents the latest chapter of an anti-God strategy employed by atheist organizations across the country - a strategy offensive to millions of Americans, a strategy that we're confident ultimately will fail in court. 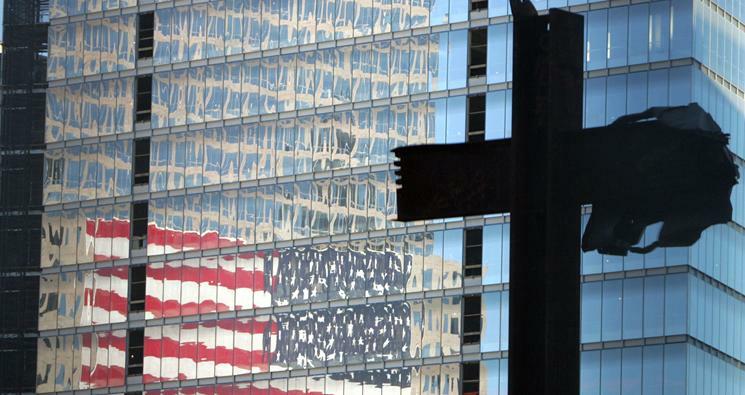 The ACLJ will aggressively defend this Cross memorial at Ground Zero. As we prepare our amicus brief, we will not only represent 9-11 firefighter and first responder Tim Brown, but we will represent a committee of concerned Americans who understand that this kind of litigation is another attack on our history, our heritage.